Adopt Euro or out of EU? Spanish Property Insight › Forums › Spanish Property Forums › Real Estate Topics, News & Discussion​ › Adopt Euro or out of EU? This topic contains 32 replies, has 9 voices, and was last updated by logan 7 years, 4 months ago. It might that this is the question UK is going to be asked soon. Which choice would you prefer? This question won’t be asked. Where is the option to continue with the pound in the EU? It’s funny this thread – I saw an article on this subject earlier today. Quite an interesting piece, but I’m not sure I agree with her conclusion : that the Euro-sceptics would easily lose a referendum in these difficult times. It would be a close run thing imo, although I imagine the likes of Cameron and Clegg would clinch it by urging the Brits to stay in the EU. Asked whether we should stand completely outside, not just in the outer tier, taking our chances with no EU influence, I think most voters will be too terrified to agree. That is why a referendum would be lost by the “no” camp, and that is why they are daft to be pressing for one. they could argue to stay in the eu and get a yes but at the moment i don’t think they would win a vote to loose the pound its the only real bit of england left.i personally don’t think opting out of the eu would damage our exports as much as some people think and with the ability to devalue our currancy we can make our exports to a strong euro europe very attractive and the saving we would make would be quite a large one that we need to spend on our ever falling systems be it road nhs or whatever.I would also like to see foreign aid cut to developing countries that are doing well enough to support their own better than they do. Of course remaining with pound in EU is the most probable choice. But Merkozy might force UK to chose between pound and EU sometimes in the near future. I doubt it will ever come back up to be voted on, nor will it come up whether the UK needs to be further in or out of the EU (unless France and Germany really have a go, but I truly doubt it seeing as the same rules would then apply to the Nordic countries). That said, as much as we all talk and possibly agree about the benefits of having your own currency, in the western world when you devalue your currency you bring on inflation at a far higher rate. There are a few new studies that show this inflation is probably the biggest reason for the disappearance of the middle class in America. In short, western economies are so dependent on imports for year after devaluing, due to no internal alternative and it takes a while for exports to ramp up. Also, laws need to be adjusted to aid in the hopeful structural shift/benefit that will be brought on by more employment/utilization but many times governments are hesitant to ‘show’ they are devaluing. I do not believe there a is text book answer any more, due to our interconnectivity and the fact that the #2 largest economy (China) has a fake currency. So the question is; seeing as the UK does have absolute control of the currency do you trust them further into the future? If so do you think them competent enough to identify the correct laws to change to aid the good export business? Up till 2000 I would never have doubted the US Gov (not the people per say, more the fact the US loved the power/respect that came from the greenback), and look where we are (or I am) today. So, for me I do not have a problem with an ECB checking on the BoE and if that means going to a the Euro, well I cast my vote.. Exactly, truth is that exports to Europe are not as strong as they claim. Much of the exports such as chemicals and drugs they would still have to buy anyway. There are world trade agreements, not being part of the “club” doesn’t mean companies won’t buy. The rest of the “sane” world manages without this ego boosting dictatorship with all it’s social policies hampering business. Why do you think that the USA and many other places have much cheaper goods, because they don’t have to pay billions every year to thousands of administrators doing bugger all in Brussels. Sales tax in the USA is less than 10%, some places 6%. Europe has VAT and 23% seems to be the new bench mark. The UK isn’t going to join the euro or leave the EU for the time being. We don’t even know what type of euro we’re getting from one month to the next. If it had any sense the UK should take a good look at which EU countries are within the eurozone and which EU countries are free from it and decide where the future lies. Given the choice between being bossed around by Merkozy and taking on Greece and Ireland’s debt, or forming strong but free alliances with the Scandinavians and the Poles the UK might be better off choosing the latter. The rest of the “sane” world manages without this ego boosting dictatorship with all it’s social policies hampering business. Why do you think that the USA and many other places have much cheaper goods, because they don’t have to pay billions every year to thousands of administrators doing bugger all in Brussels. Sales tax in the USA is less than 10%, some places 6%. Europe has VAT and 23% seems to be the new bench mark. based on 2007 figures: EU budget 116 billion. The administration budget covers salaries, pensions, buildings and equipment. As much of the EU’s work takes place in Belgium and Luxembourg, almost three-quarters of the spending is allocated to these two countries. The total cost of running the EU falls somewhere between the budget of the Mayor of Paris – 7bn euros in 2008 – and the Mayor of London 4.2bn euros (£3.2bn) in 2009/10. The European Commission accounts for about half of the total spending on EU administration employing around 33,600 people in 2009. Commission staff can claim a range of allowances, including for living abroad, travel home and their children’s education. I doubt they know what they spend, the accounts haven’t been signed off for years they are so full of holes. How many levels of government do we need? eg Spain has regional Gov. National and MP’s for EU Parliament…totally un-necessary. As I have posted on another thread part of the EU is heading in a one way direction of statehood. The remaining 10 nations who so far have indicated they wish to remain outside that concept will continue to try and reform it with a limited voice. Opposition to Germany and France at EU summits does not win you friends. The UK needs to trade with Europe without barriers. No less than 40% of UK exports go to Europe. The loss of these markets would be a disaster. The real question is should these 10 nations outside the Eurozone form their own block within the existing EU to prevent any further loss of sovereignty. There seems little political appetite for that at the moment but I can see a future time when that will happen. The UK is a lone voice most of the time. Germany and France have too much power over smaller nations and they need to be prevented from coercing them into surrendering their national independence. I agree that the UK won’t leave the EU…pity, they don’t need it. Those export figures are scewed. It will carry on and on like a runaway train. Everyone keeps saying the UK will be on the sidelines….so they should be! None of our Politicians have the guts to leave. Lets just hope it all folds anyway. Even this so called new deal doesn’t address what needs doing right now, just what will happen in the future. Both Spain and Italy’s borrowing cost went up today. Logan – that’s the point I was trying to make above. If we end up with a eurozone superstate it will be weak for many years while it deals with its various deficits and debts, and implements the necessary fiscal reforms – if it ever gets that far. The Germans think that the problem will be solved by getting certain countries to control their spending. I think they are mistaken, but either way the medium term prospects for any eurozone superstate will be much worse than those EU countries outside it. It’s those 10 countries who should be working together to make sure they stay out of this mess and form a collective voice that can fight their corner. Also I should add that if a superstate does get formed, Merkel will probably lose the next German election, so who knows who will be in charge of the eurozone economy – quite possibly a weak coalition of allsorts. I’m not convinced on this. I hear more people nowadays who are calling for the UK to leave the EU. No idea how big a percentage of the population they represent though. Aren’t there politicians in the coalition who want to hold a referendum on this? Aren’t there politicians in the coalition who want to hold a referendum on this? The Liberal Party are very pro Europeans. There is currently a high percentage of Tory backbenchers pushing Cameron in the political direction of the old Bruges group. Since he needs the coalition to survive he’s currently running with the hare and hunting with the hounds. He has agreed a referendum “if a treaty change affects Britain.” That’s ambiguous and means very little. I believe this EU summit on Friday will end in the classic compromise of our old friends Fudge and Mudge. A bit of everything for everyone and nothing in the actualité. I don’t know why Cameron doesn’t tell the Liberals to take it or leave it. Recent opinion polls gave them a smaller share of the vote than UKIP. 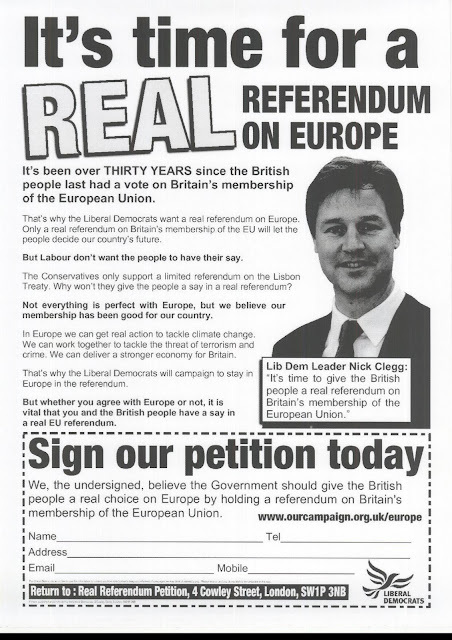 Clegg would be unlikely to force a vote, he would be out on his arse for good. Although I suppose he could go back to work in Brussels! Very interesting commentary from Peter Oborne. Europe, and conceivably the world, stands on the edge of economic calamity. If this week’s summit goes wrong and the euro disintegrates, the scale of the disaster cannot be exaggerated. Every bank in Europe will go bankrupt and be taken into state control. The British economy would be defenceless in these circumstances. It would not be surprising to see output fall by more than 10 per cent and unemployment surge towards four million as a result. We would lurch into economic depression for the first time since the 1930s. In these circumstances, the Prime Minister has one fundamental duty. He must strain every sinew, make any sacrifice, to avert disaster. It would be a matter of national shame and disgrace if we toppled the euro over the edge by making too much of an issue out of working hours or the regulation of small businesses. Of course, Cameron will be accused of selling out, and it will then be especially hard for him, because he cannot explain the real reasons for his conduct. He cannot say that he believes the world is on the edge of a financial precipice without being guilty of reckless alarmism. He cannot add that he believes that the euro is a terrible error and probably doomed without causing pointless offence in Europe, and therefore ruining alliances that may serve the British national interest in future. That cobblers is what they always maintain and that’s why we have the current disastrous situation because no politicians in the past except Margaret Thatcher had the balls to stand up and say otherwise. I’m not sure I agree with that. I can’t remember a time prior to this period 2007-11 when people were seriously talking about 25 banks going bust and the world economic system collapsing. Well, maybe the oil crisis of the early 70s, but that was before Maggie’s reign. Outline of EU summit plan here. It’s a two speed Europe on the horizon. Could this actually be the right path for the UK? The inner core can decide on their own policies to suit their Eurozone. We can stay part of the “slow-zone” (although we may in fact have a faster growing economy) and refuse to enact the measures we’re not happy with. Short of actually pulling out of the EU, this could be the best option for Britain? The Liberals would simply form a government with Labour and revoke everything the Tories have done since election. The Tories can then get to their irrelevant squabble about the EU from the opposition benches. It’s clear now the Mercozy plan involves two Europe’s, since they know well the remaining 10 nations outside the Eurozone will not sign up for fiscal union on the basis they are suggesting. The Tobin tax is a glaring example. Actually I think that will create in the future a far stronger union, stricter budget controls and an eventual powerful currency. The consequences for the peoples of these countries however means austerity for a very long time. Restricted economic activity and high unemployment. That in turn means more of the same for the UK because without a performing Europe the UK suffers. If core Europe goes ahead alone with the Tobin tax, financial services in Frankfurt, Paris and Dublin will be moving to the City of London pretty soon. Our economists believe the sovereign debt and banking crises are causing a renewed recession in the Euro Area. Beginning in 4Q 2012 [Sic], they forecast real GDP to contract for 6 consecutive quarters. It is expected to be an especially protracted recession. Not even in Japan, during its lost decades, did real GDP decline for 6 consecutive quarters. Our economists’ Euro Zone forecasts imply real GDP will be some way below the trend established during the first 10 years of Euro inception (Figure 3) and not get back to previous peak levels for many years to come. “Not even in Japan, during its lost decades, did real GDP decline for 6 consecutive quarters”. That’s bad. So, the obvious next question is, who will most affected? Eastern Europe is the most exposed from a protracted Eurozone recession and deleveraging in the banking system, says Citi strategist Robert Buckland. We should stress that Figure 7 highlights the potential trade vulnerability to a Euro Zone recesssion. At the moment, our Euro Zone economists do not forecast a contraction in imports over the next two years (they forecast flat imports in 2012 and a 2% increase in 2013). So based on our forecasts, there may not be serious contagion via trade. Those export to GDP ratios look suspect to me. They have the UK at just under 10%. In 2010 47% of UK exports went to the Eurozone so on that basis that chart is indicating that total UK exports amount to just over 20% of GDP. Can that be right? 47% of 20% is 10%. OK, so we assume 10% of UK GDP is dependent on the Eurozone. That’s relatively small potatoes. That begs the next philosophical question. Does the UK really need to be a part of the European project? Politicians continue to state that Europe is vital to the UK’s national interests. The evidence seems to be that is actual hogwash. There is another agenda here and I’m not sure what it actually is. A political union perhaps is good for many other things but it does not appear to be a major factor in the prosperity of Britain. In fact if the Euro collapsed Sterling would appreciate by at least some 25-30% against the new Spanish Peseta. Agents clamouring for the UK to enter the Euro to boost their business are shooting themselves in the foot. It would have the entirely opposite effect. It will not happen of course but if it ever did the UK would insist entering it at around parity. The EU would want convergence at €1.50. Entering at parity would price the British out of Spain and Europe for good.